I'm Not Skinny: For the love of socks! I absolutely love a great pair of socks. As a person who hates wearing pants, I'm always looking for higher socks to get me through the fall weather. However, I've come to realize that finding good socks is tough. 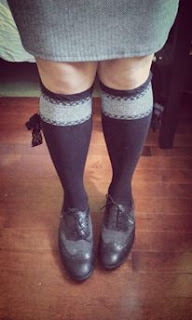 I want over the knee, thigh highs and knee highs and finding these of quality is proving to be difficult. I'm putting out an APB, where do you buy socks? If there are companies looking for bloggers to review some socks, get in touch with me. I'd love to give your site/products a shot and then write a review about my experience. If there are #BBloggers who have sites they love and have gotten awesome socks from, please let me know. I'm preparing to go sock crazy. My plan is to avoid pants for as long as possible, and as the weather chills down I'm going to need higher socks! Please help me find quality socks. That's a good idea. I'll have to look! Thanks.